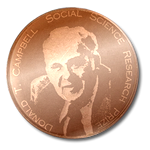 Donald T. Campbell, University Professor at Lehigh from 1983 until 1996, was world renowned for his pioneering work in social science methodology, evaluation research, and the application of social science to the understanding and solution of a wide variety of social issues. A member of the National Academy of Sciences, Campbell was among the most cited social scientists in history and a beloved mentor to generations of students and colleagues. Two $1000 prizes will be awarded to outstanding research papers in the social sciences, one undergraduate and one graduate. The competitions are open to all Lehigh students and all work in the social sciences, broadly conceived. Papers must be the work of a single individual. Specifically excluded are those based on group projects, even if the paper is authored by an individual. Collaborative work with a faculty supervisor is not eligible. Papers should be article length -- no more than 10,000 words (about 50 pages of double-spaced type). And, the focus on important societal issues. Papers should be submitted in Word, WordPerfect, or PDF formats. The interactive submission form will request the name of a Lehigh professor who can verify that the paper is the student's work. It will also ask for a very brief abstract/summary of less than 50 words. The 2019 submission deadline is May 4th. The electronic submission from is available at: http://go.lehigh.edu/campbellprize. Any questions can be directed to the committee chair or any member of the Campbell Prize committee (see below). 1) I am now a Presidential Scholar, but my paper was written before I graduated. Which competition do I enter? To be eligible for the undergraduate competition, the author must have been a Lehigh undergraduate working toward his or her first bachelor’s degree at the time the submitted paper was written. Post-bachelor’s Lehigh students, such as Presidential Scholars, can submit work to the undergraduate competition if it was finished prior to their first Lehigh graduation, but papers written or revised after that graduation ceremony must be submitted to the graduate competition. 2) What does "article-length" mean? My thesis is 60 pages. We usually think of articles as 30-35 pages or less, with 50 pages the upper limit. Manuscripts that are longer than 10,000 words should be edited down, because the volume of submissions and the short time period available for evaluation leave us unable to guarantee a full reading for very long ones. Your faculty supervisor may be able to offer tips on how to most easily cut the manuscript. 3) What does "article-length" mean? Does my term paper of 10-15 pages have a chance in competition with honors theses that are 50 pages in length? Yes, because those papers will face higher expectations, given their length. The committee strives to take into account different circumstances -- the "submission category" questions on the online form help us to identify those circumstances and take them into account, as appropriate. 4) Are master's theses eligible for the graduation competition? In principle, yes, if the thesis is trimmed to conform to the specified "article length." See above. 5) My paper was written individually, but it was based on research conducted by a group. Is it eligible? No. Several years ago, group papers were eligible, but no longer. 6) I met with my honors thesis supervisor weekly and she gave me a lot of guidance in my research. Does that disqualify my paper? Not at all. After your submission, your faculty supervisor will be asked to verify that the work is your own and did not result from collaboration with faculty or other students. He or she will recognize if you "benefited from more than the usual faculty guidance."